Secure Baby's Cloth Diaper With Diaper Pins or Snappi. Cloth Cloth Diaper Pins and Snappi Diaper Fasteners are a staple when cloth diapering a baby or toddler in prefold diapers or fitted diapers without snaps or velcro closures. Contour diapers also require cloth diaper pins or snappi fasteners if they are not secured around baby with a cloth diaper wrap style cloth diaper cover. Secure prefold diapers and other cloth diaper styles to baby with diaper pins or fasteners! It is important to choose diaper pins or fasteners that are hygienic and easy-to-use, but also safe and reliable, as these will be near baby's most sensitive areas. We carry high quality plastic topped and heavy duty brass locking head diaper pins like Diaper Rite Diaper Pins. If the idea of diaper pins leaves you squeamish, try the Snappi Diaper Fasteners. Available in a variety of colors, their T-shaped stretchable arms will grip baby's cloth diapers snugly, allowing baby room to move about naturally with a stretchy 'give and take'. If you are already using or if you are considering cloth diapers, check out our new line of Dritz pins and Snappi fasteners. A must have for cloth diapering, these fasteners are safe, easy to use, and best of all, feature cute colors and styles. Dritz Diaper Pins are a more traditional fastener. Made of stainless steel, the pins are tough enough to hold a cloth diaper on even the most wiggly and active toddler. However, the security cap ensures baby will not be poked by the pin. The fastener also features a curved body, allowing you to easily pin a cloth diaper without poking baby. Our Dritz Diaper Pins come in packages of four, and you can pick from four different pastel colors - blue, pink, yellow, and white. Pair these with a few cotton cloth diapers and you're ready to go! For parents who don't want to use a pin on their child's diaper, we have the Snappi Diaper Fasteners. This alternative fastener has NO metal, meaning there's no poking baby while changing a diaper. Snappi Diaper Fasteners are easy to use - simply hook the diaper with the grippers. There's no pointy parts to harm baby. 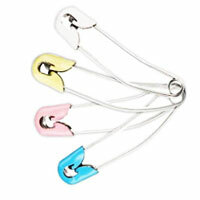 Snappi Diaper Fasteners come in several day glow and pastel colors to accent your baby's style. Whatever fastener you decide to use, you'll be saving money by using cloth diapers and fasteners instead of disposable diapers. 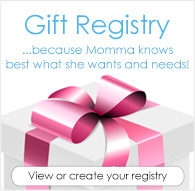 You'll also be helping baby avoid rashes and uncomfortable chafing and they grow and move.